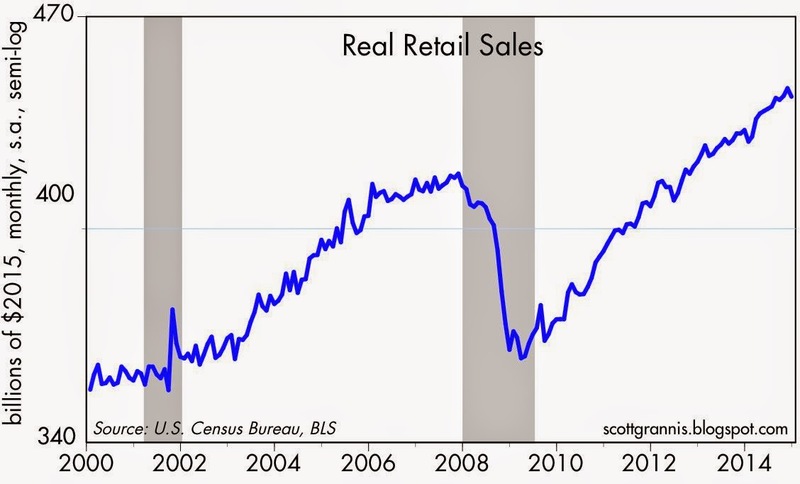 Zero Hedge, a reliable source of negatively-spun information, summed up today's retail sales report like this: "Retail Sales Plunge Twice As Much As Expected, Worst Back-To-Back Drop Since Oct 2009." On the surface, the news was indeed disappointing, with overall retail sales falling much more than expected (-0.8% vs. -0.4%). But considering the plunge in gasoline prices in recent months (which is actually a very positive development), sales weren't bad at all. 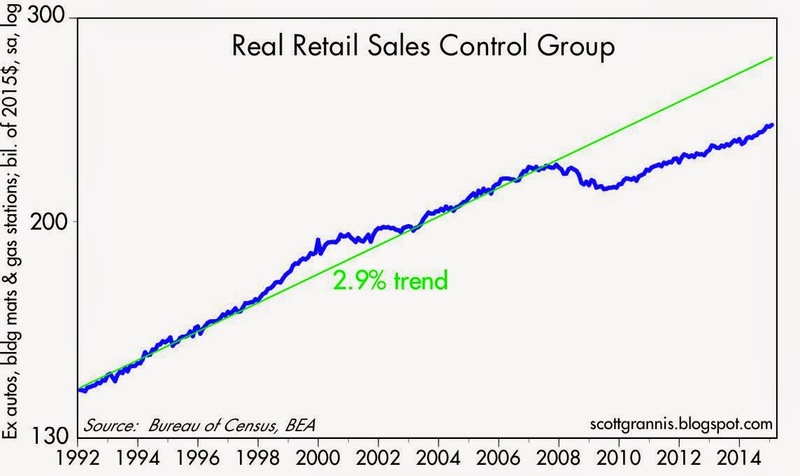 The chart above shows total retail sales adjusted for inflation. Here we see that January's weakness is almost insignificant. Real retail sales rose 2.9% in the 12 months ended January, and that's almost exactly the average annual rise we saw in retail sales in the years prior to the Great Recession. Abstracting from autos and gasoline, sales were up 5.7% in the past year. Nothing unusual going on here. Abstracting from the most volatile sectors of the retail report (building materials and gasoline), and adjusting for inflation, there was actually a decent pickup in growth over the past year. This measure of sales rose 3.9% in the 12 months ended January, and that was the fastest such growth in the current economic expansion. As the chart above shows, however, sales are still quite low compared to where they could have been had this been a normal recovery. This has indeed been a sub-par recovery, but there are still no signs of emerging weakness. And in some respects, the outlook is even improving on the margin. The best that can be said for the Velocity of M2 is that during 2014 it began flattening out around the 1.53 level. I also wonder if the government numbers-crunchers are catching Internet sales. Or the growing market of Craigslist grey-market sales. And it is a one-month wiggle. BTW, the numbers of hours worked in private-sector now is back to 2009 levels---and back to 1999 levels. It is not just this recovery, but the US economy since the 1990s that has not really performed. Pathetic. I think both employment levels and output levels should be up 10% from here. But the Fed wants to tighten, and Obama is proposing a bigger federal budget. And the Congress may give him an even bigger one than he wants. 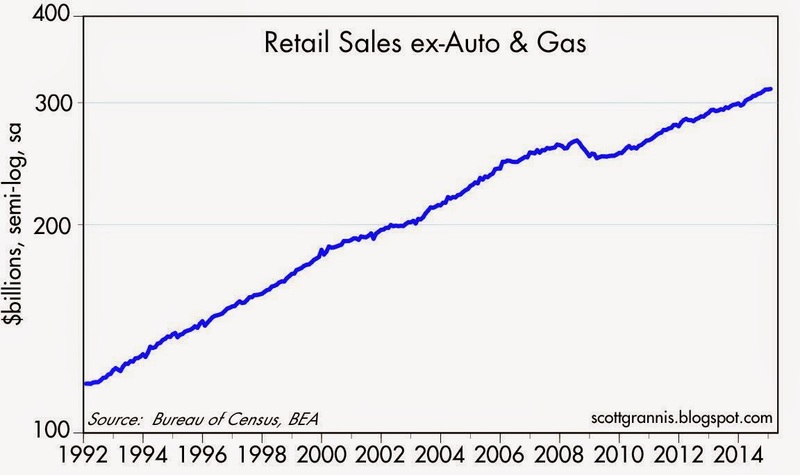 In the chart with retail sales ex autos and gas, the great recession almost looks insignificant too. William: In the old MV=PT, does this mean if we boost M now we see some action on the PT side? Since P is flat, a lot more T? Benjamin: You are consistent. And right again! With a static P and a static V, boosting the money supply would result in greater real GDP. Bingo! I have been doing a lot of reporting lately on quarterly earnings reports. Seems to me more and more companies--now, the majority--headline non-GAAP earnings. Even non-GAAP, or adjusted, EPS. The analyst community seems to have adapted, and they make their estimates on expected non-GAAP, adjusted earnings. Seems to me 20-30 years ago, the industry was GAAP. My memory is going blotto, but I covered a lot of earnings reports back in the 1980s, early 1990s, and it seems to me people honored GAAP. We looked askance at slicksters who wanted to skirt tough GAAP reporting. Okay, this leads up top the bigger question. When S&P says the market is trading at X times earnings, are they going with non-GAAP or GAAP, or a mix? Man, what a mess. How does one compare appeals to apples over a few decades? SINGAPORE, Feb. 17, 2015 /PRNewswire/ -- Prices of spot liquefied natural gas (LNG) for March delivery to northeast Asia saw their largest year-over-year drop on record, plunging 61.7% from March 2014 to average $7.436 per million British thermal units (/MMBtu), according to latest Platts Japan/Korea Marker (Platts JKM™) data for month-ahead delivery. A near 62% drop in LNG prices in one year. Wow! Deflation everywhere all the time?